Whether you already have a blog but are yet to see an income from it, or if you’re thinking of starting a profitable blog then you’re in the right place. 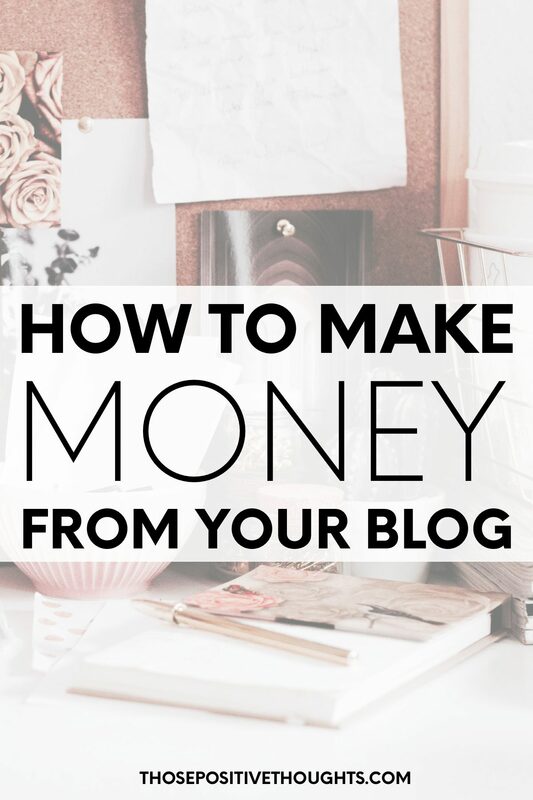 In this post I’m going to share with you the methods I use to make money blogging and the many other ways bloggers can earn an income online. It doesn’t matter if you started your blog a three years ago or if you’ve only just started one, I will tell you the tactics I use to make money from my blog. If you’re a new blogger and keen to make money with your blog, then first of all, you need to start your own blog! I do not have a huge following. I just want to mention that I do not have a huge following. At the moment I have around 30,000 page views a month, an email list of 2,000 people and my biggest social media following is Pinterest with 10k followers. While these are great numbers they do not compare to big bloggers. I do not pay for advertising. Another thing which I would like to mention is that I do not pay for advertising. Mt blog traffic is all organic. This blog post contains affiliate links. Any sales made through such links will reward me a small commission (at no extra cost for you). I started my blog in December 2016 and it took a long time for me to start earning an income from my blog. This was because I wasn’t monetising my site. I was bringing in great traffic and my best month reached over 300,000 page views! But at the time I hadn’t monetised my posts. Since starting my blog I always knew I wanted to do it for a living, my passion for blogging was so great. I would wake up early to blog, spend my evenings writing and I loved the idea of spending Sunday working on my blog. It wasn’t until I started reading other bloggers income reports that it opened my eyes to the potential my blog had. It made me realise that I could one day turn my blog into a full time income. Suddenly my 9-5 high-stress job was something which I needed to escape. All I could dream about was earning money from my blog so I can create a stress-free life doing something I loved and something which helped others in a way my 9-5 office job never could. I decided to increase by blogging efforts and focused more on how to monetised my blog, but still ensuring that I am providing valuable and meaningful content to my readers. Using my money from my 9-5 job, in 2018 I made two investments towards my blog, the first one was investing in Wonderlass 5 Day Profit Plan blogging course and a 1-1 mindset coach, as I needed someone to help me step out of my comfort zone and stop me from holding myself back from success. In 2018 I also set up a woo-commerce shop on my blog and set up a Teachable account to create and sell valuable online courses and e-books. You can check out my shop here. In April 2018 (month this post was published) I left my 9-5 job. It was an exciting but difficult decision to make as I’m not earning less from my blog as I did from my 9-5. However I knew that it was something I had to do. I knew that if I didn’t take the opportunity now to give my blog a a real chance then it might never do it. I’m certain that with hard work, dedication a and my passion my blog income will soon over take my previous 9-5 salary with the added freedom of working for myself, doing something I love. There are various ways you can make money from your blog, below are the ways I currently earning an income online. Adverts: The main way I currently earn money online is through advertising. I use to have adverts with Google Adsense, until recently heard about Mediavine through a Facebook group. It took a month to get approved and set up my adverts with Mediavine but I am so glad I made the switch as Mediavine had doubled by advert income in comparison to Google Adsence. To join Mediavine you need 25,000 sessions a month to join making them more accessible to smaller bloggers. Digital products: I set up my own woo-commerce shop which meant I was able to create and sell digital products such as e-books and calendars. Setting up my shop with woo-commerce means I can sell products directly on my shop and avoid seller fees which you would find on Etsy and eBay. I recently set up a free account with Teachable where I create and sell online course. I even have a free course which you can take to simplify you life in seven days! With my courses I also offer a 30-day money back guarantee as it believe in mu products and I want my audience to know that they can invest on my courses risk free! Affiliate links: The last way I make money from blogging is through affiliate links. This is something which I want to work on more to increase my profit. Some of the affiliate programmes which I am associated with include Amazon, Siteground and Wonderlass 5 Day Profit Plan. Affiliate programmes allows you earn a small commission when someone purchases a product or a service through your affiliate link, at no extra cost to the buyer. These are the three ways I currently make money from blogging. However there are so many other ways you can earn money through your blog, I have listed these other ways below! As I mentioned earlier, one of the main ways I make money through blogging is through advertising with Mediavine. However there are other types of advertising you can have you on your blog to earn money such as advertising through podcasts or videos. If you have your own podcast you can advertise related products or services in each episode. If you have a YouTube channel you can insert Google Adverts into your videos to earn extra money. Another way to earn money on your blog through advertising is through sponsored posts. Click here for a master list on where to find sponsored posts opportunities. Affiliate marketing is a great way to make money blogging and one which I want to start monetising more. Affiliate programmes allows you earn a small commission when someone purchases a product or a service through your affiliate link, at no extra cost to the buyer. Other types of affiliate marketing include private affiliate programmes, these are affiliate programmes which you ca n join if you have purchased the products or service which you are selling. For example with Amazon affiliate links you there is not a restriction to which products you can be an affiliate for. Unlike the Wonderlass 5 Day Profit Plan blogging course which I’m an affiliate for, you need to be a student in this course to earn a commission. Click here to read the top 15 affiliate marketing websites. There are lot of bloggers who earn money by offering services. Last year I invested in a 1-1 mindset and personal growth coach with Sam Laura Brown, which is a coaching service which she offers on her blog. There are many other types of services which you can offer such as freelancing, consulting, design and workshops. Offering services mean you can greatly increase your blogging income however this isn’t passive income, therefore you will need to invest your time in order to earn money. Unlike adverting and affiliate links which is passive income, meaning you can earn money while you sleep. Selling physical products is another great way to make money blogging and something which I would like to look into in the future. You can sell physical products through WooCommerce, Etsy, eBay and Amazon. Selling digital products is a quick and easy way to start earning extra money from blogging. When selling digital products such as e-books, calendars and printables you will need to set up a business account on PayPal and choose a platform to sell your products, such as Woo/commerce, Etsy and Teachable. In addition to running a blog, some bloggers also organise blogging and networking events. One of my favourite bloggers, Scarlett London, organise a number of events in and around London, SL Events. These have included smaller, more intimate lunches and large scale exhibition style events. Organise and running events takes a lot of work and you would need to build a great relationship with your audience but it is something which would make you and your blog stand out, plus it’s a great way to meet other bloggers, brands and earn extra money. They are just a number of ways you can make money blogging, but please not that blogging is not a get rich quick thing. Well, it isn’t for most people, myself included. Blogging takes a lot of hard work, trial and error, networking, late nights, early mornings and a great skill to balance your side hustle with your full time job. To make money blogging you need to have a passion for your blog and the content your writing, otherwise you will get bored real quick. You need to focus on creating excellent content with your audience want to read. You need to drive traffic to your blog, I recommend using Pinterest to drive huge traffic to your site. P.S I have written a super helpful ebook to help you grow your blog with Pinterest. You can check it out here. Let me know if the comments below if you have any questions.